Kids sometimes struggle with knowing how to punctuate dialogue in their writings. So here’s a way fun activity for you to practice this as a whole class. Print out a copy of these pictures of animals in Halloween costumes and put them under your document camera. If you’ve got a way to connect your computer to your projector, then you don’t have to print the pages. But either way, show the class the picture and decide on a sentence to write as a class. Point out where quotation marks go and how the fit with whatever punctuation mark is at the end. If you want some independent practice, have your kids write their sentences on personal whiteboards so they can hold it up to show you. Happy (grammatically correct) Halloween! This entry was posted in Grammar, Halloween, Language Arts, Writing Prompts and tagged Children, Education, Elementary School, Halloween, Homeschool, Kids, Teacher Resources, Teachers, Teaching, Writing by Squarehead Teachers. Bookmark the permalink. 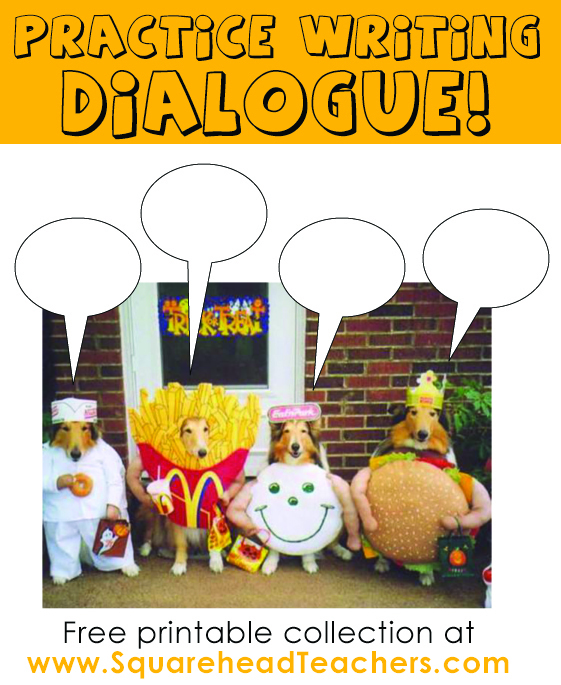 I love the idea of adding the dialogue bubbles to images. I will definitely incorporate this in my lessons this coming week! Awesome! I’ve seen some really funny ones out there. If you come up with some good ones, let me know!